Run through the Hazards of the Disney Animated Canon! Crossy Road is back, and it's brought some new friends this time. The cast of Pixar and the Disney Animated Canon have joined in on the fun. Now you can weave your way through the hazard-ridden worlds of The Lion King, Toy Story and Inside Out with one of the many colorful characters that only Disney can create. Can you play in traffic with Goofy and survive? Can you brave a stampede of wildebeest as Simba did? Can you avoid getting a game over screen with Wreck-It Ralph? These questions and more can only be answered when you play Disney Crossy Road! Disney has been spreading joy to people of all ages for decades now, but that doesn't mean it's always been sunshine and roses. The worlds they've created have always been rife with dangers, and it's your job to stay clear of them in Disney Crossy Road. Avoid cars, African wildlife, bandits, boulders and more as you cross the deadly roads of the Animated Canon. Don't linger on the railroad tracks or stampeding trails for too long or you'll regret it! Cross rivers safely by riding on lily pads, floating logs, wooden ships and crocodiles. Stay on the move, lest you be carried off by an eagle, vulture, helicopter or the Claw. Features procedurally-generated levels. Play a whole new world with every game you play! Disney has no shortage of delightful characters and hammy villains in its extensive cast, and Disney Crossy Road is no exception. Play with all your favorites and see how far you can take them in the Hipster Whale's crazy cubic universe! Unlock and play with over 100 characters, including Mickey Mouse, Donald Duck, Pumbaa, Vanellope von Schweetz, Rapunzel, Sadness, Judy Hopp, Buzz Lightyear and more! Play in the African wilderness, the Haunted Mansion, the Sugar Rush arcade cabinet, the mind of Riley Andersen, and Andy's bedroom, each with their own unique sets of obstacles to overcome. Pick up coins on the road to unlock new characters and levels. Why did the anthropomorphic mouse cross the road? If this app is anything to go by, because it was a ton of fun. Disney Crossy Road is one of the single most addictive games you could ever hope to play on your phone. With a variety of worlds to explore one hop-step at a time, unending challenges, hundreds of delightful characters to unlock, and dozens of secrets to discover, you may very well never need to play another game again. With Disney Crossy Road in your hands, even the long lines at Walt Disney World will breeze on by. Leave it the folks over at Hipster Whale to ask the important questions. Back in 2014, when they released Crossy Road, they asked the world one of the most prudent riddles of the ages: Why did the chicken cross the road ? Over a year later, they have come back with a new one: How can perfection be perfected ? That's definitely a tough nut to crack, but Disney Crossy Road provides some insight. Crossy Road was and still is one of the best free mobile games to ever be released, and the good news is that this new iteration does indeed improve upon it. It still plays the same as the original game, but goes through the ringer to make it more varied, wild and challenging than ever before. The use of the Disney license is merely the cherry on top. Just like Crossy Road before it, Disney Crossy Road plays much like an updated version of the arcade classic, Frogger. The object is to move your little avatar from one side of the game world to the other, crossing rivers and roads while trying to avoid getting run over by cars. However, the Crossy Roads differ from Frogger in a few very distinct ways. For one thing, they never end. You don't move from one level to the next; the game just keeps on scrolling by, throwing new paths and hazards at you randomly until you finally make that one fatal mistake. For another, you're not just dealing with cars. There are trains, animals, traps, walls and other things you have to work around. Even time is not on your side, for waiting around without moving for too long will result in your poor little avatar getting swept up by an airborne predator of some sort. 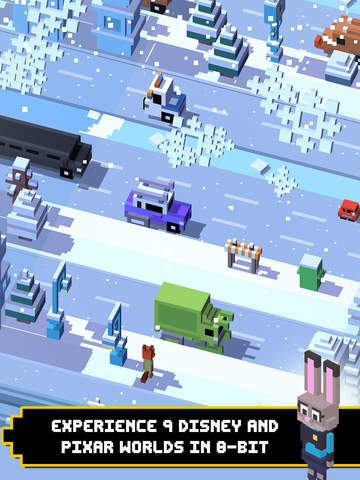 In short, the Crossy Road series takes what worked in Frogger and combines it with the elements of a free runner. The results are amazingly fun and work very well for the mobile format. There is no end goal, aside from seeing how far you can get and trying to beat your record with subsequent replays. With every round generating a whole new world, it seldom ever gets stale, making it a dangerously addictive app to play. The only wrinkle in the formula is the control scheme. A finger tap moves your character forward a step, and a swipe will move it in the corresponding direction. It's intuitive and it works most of the time. However, because the act of moving left, right and down requires a more precise motion on your part, it means that going in those directions isn't going to feel nearly as responsive as simply going up. It's not a game-breaking deal by any stretch of the imagination; Disney Crossy Road is perfectly playable. It just feels like you'd probably spend less time peeling yourself off the pavement if you were playing with a more responsive controller, like a keyboard or gamepad. 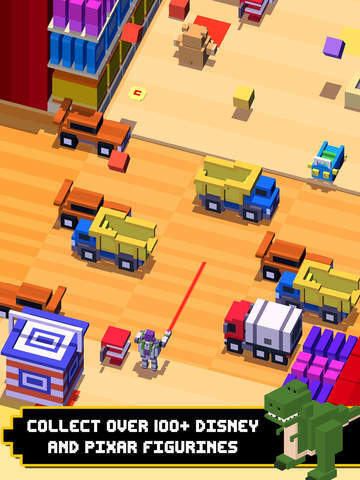 Besides its addictive gameplay, Crossy Road is known for its playful cubic art style. While visually simple, it was creative enough to give the app a distinct look and lent itself well to a cartoony sense of humor as you watched your poor avatar flatten into a pancake after getting run over. Disney Crossy Road is no different in that regard. While it would have been nice to play a Frogger-like game with the characters looking as they did in the original films, there's still something neat about seeing Woody, Vanellope, Rafiki, Baymax and Mickey as these charming Lego-like figurines. The levels are just as good too, featuring even more colorful cubic environments to reflect the settings of the films they're based on. The original Crossy Road was no stranger to creating varied worlds, and it indeed had dozens. 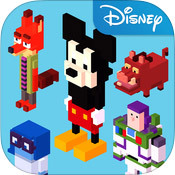 However, Disney Crossy Road ups the ante. While it has considerably fewer levels than the original game, they are much more varied than ever before. The world of 'Mickey Mouse and Friends' is brightly-colored, with thick outlines for everything, and features typical Crossy Road things like cars, trains and rivers with logs and lily pads to jump on. Meanwhile, the Lion King level takes place in a cubic savannah, where animals like zebras and elephants replace the cars, and the rivers are teeming with crocodiles. However, the levels are not just different in terms of cosmetics. They play very differently too. For example, the aforementioned Mickey level feels like the old Crossy Road game. Meanwhile, The Lion King world replaces the trains with a much wider wildebeest stampede that requires careful timing to get past. Big Hero 6 has a unique hazard in the form of manhole covers that will outright kill you if you land on them, and 'Wreck-It Ralph' has a completely different scoring system based on how many collectibles you can grab before crashing. On that note, not only does each level require a different approach, but they also vary in difficulty. Mickey's world is by far the easiest, whereas the Tangled stage, which has the most hazards of all the worlds thanks to its bandit-congested roads, slithering snakes, and crates rolling in from the top of the screen, is by far the hardest. Overall, the sheer variety in level design means it's hard to truly get bored of Disney Crossy Road. If the app ever starts to feel repetitive, then just switch to a new level and it will feel fresh again. The only shame is that the app draws from such a small selection of Disney films. None of the current characters or levels come from films that predate the '90s, and besides The Lion King, only CG movies get any kind of representation here. Maybe over time, some of the other Disney classics will get featured, like Pinocchio, Fantasia and Aladdin, but until then, you're going to have to mostly stick with the post-2010 stuff. However, what truly elevates Disney Crossy Road above most other mobile games is just how friendly it feels to you. The app never forces you to break out your credit card or give it ad revenue. You can acquire new characters by either buying them a la carte, or earning them through normal gameplay. The game has ads, but you are never forced to watch them. You can if you want to get a few extra coins, but it is always your choice. Few other apps are willing to be so generous to the consumer, and the fact that Hipster Whale is happy to just let you have your fun deserves to be recognized. That's Disney Crossy Road in a nutshell. A charming and fun game that's worth a heck of a lot more than you'll ever need to spend. Fans of Disney and Pixar can definitely get a lot of mileage out of it, but even those who don't care for those films will still find much to enjoy.